Google I/O, our annual developer conference, begins in just two days, and this year, we’re bringing you more than 130 technical sessions, 20 code labs and 155 Sandbox partners. If you’re not here in San Francisco, you can still sign up for one of our 350+ I/O Extended events around the world or tune in to I/O Live to watch the live stream from wherever you are. This year’s conference kicks off on June 28 with the first day’s keynote at 2:30 a.m. EST and the second day’s keynote on June 29 at 3:00 a.m. EST, so tune in early at developers.google.com/io to avoid missing the action! We love building with LEGOR bricks. We loved it as kids, and we still love it now. Visit any Google office, you’re going to see LEGO bricks all over the place. So it’s with childish delight that today we can announce Build. Over the last few months we’ve been working with LEGO Australia, thinking about what would happen if we brought bricks to the browser. Build is the result: our latest Chrome Experiment which lets you explore and build a new world of LEGO creations together online. With 8 trillion bricks, think of Build as the largest LEGO set you’ve ever seen. Right now Build is an experiment we’ve been working on in Sydney. We’re launching first in Australia and New Zealand and hope to open up in other countries soon. This year is the 50th anniversary of the LEGO brick in Australia and Build joins the celebration of the LEGO Festival of Play online. Over the next few weeks and months we hope to see you fill the Build world up with everything from medieval castles to sea snakes, giant mouse cursors to smiling monsters and even a Kiwi! Share your creations with us on +Google and we’ll re-post the most inventive. You can start building at buildwithchrome.com. shown the growing importance of the internet as more and more people turn online for critical information. The question now is: how can governments, authorities and private companies like Google, help meet this demand? Last week, we hosted our first Emergency Management Roundtable, which brought together more than 60 of Australia and New Zealand’s leading emergency management practitioners. The Roundtable was led by members of Google.org’s Crisis Response team and local engineers involved in crisis response work in our region and beyond. From our perspective, we’re keen to share what we’ve learnt on using technology for disaster preparedness from Google’s responses to recent disasters such as the Japanese and Christchurch earthquakes. But crucially, we also think there’s a need to foster better public/private collaboration between emergency services organisations, government agencies and Internet companies such as Google. Provide more data - in times of crisis, we should look at making as much information available as possible. In Australia Google’s Crisis Response efforts date back to 2009 where our engineers helped map the location of the Victorian Black Saturday bushfires. We’re encouraged by the progress made towards making more information available, but we also know there’s a lot more to do. At Google, recent natural disasters in Australasia have shown the growing importance of the internet as more and more people turn online for critical information. The question now is: how can governments, authorities and private companies like Google, help meet this demand? more than half of Australians now calling a smartphone their own, things are just getting bigger and bigger. While the smartphone revolution is in full effect, another revolution is silently happening in its shade: the growth of the other mobile device called tablet. According to Telsyte 2.6 million Australians already use a touchscreen tablet. By 2016, that number is forecast to grow to 11 million. Looking at Google search queries, our consumer research, and other external surveys and commentary, we think that we have a pretty good overview of how the new wave of “multi-screen consumers” are using their different devices. The PC has become the workhorse. When we think PC, we mostly think about admin tasks such as replying to work emails and working on our household budgets. The smartphone on the other hand is our “constant companion.” It gives us access to relevant and immediate information when we need it most: when we are out and about. Of course, it also helps us kill time on the bus. At Google we like to think of the tablet as the “couch companion.” When we look at the activity on tablets, we see a sharp increase towards the end of the night, peaking very late around 9 pm. During that time we do things on the tablet that we enjoy while relaxing: listening to music, updating social media, watching video, researching interests and things we want to buy. Watching TV at home is still the preferred form of entertainment for 64% of Australians, but we tend to be multitasking as more than half use smartphones and tablets while watching TV, following a Deloitte survey of more than 2,000 Australians across four generations. The survey also found that 60% of viewers multitask on electronic devices. The current prices of tablets mean they are still regarded as a luxury item, rather than an essential one. This also means that the demography of owners are skewed to more affluent households, and this provides an opportunity for advertisers who covet that market. Many businesses see tablet users buy more on their website as well as buy more often. On the tablet, marketers can reach engaged eyes that are on a device they purchased to research, and use to shop. My message to them: get on tablets now, your clients are already there. We have been saying that smartphones are the next big thing for a few years now, and with more than half of Australians now calling a smartphone their own, things are just getting bigger and bigger. While the smartphone revolution is in full effect, another revolution is silently happening in its shade: the growth of the other mobile device called tablet. According to Telsyte 2.6 million Australians already use a touchscreen tablet. By 2016, that number is forecast to grow to 11 million. 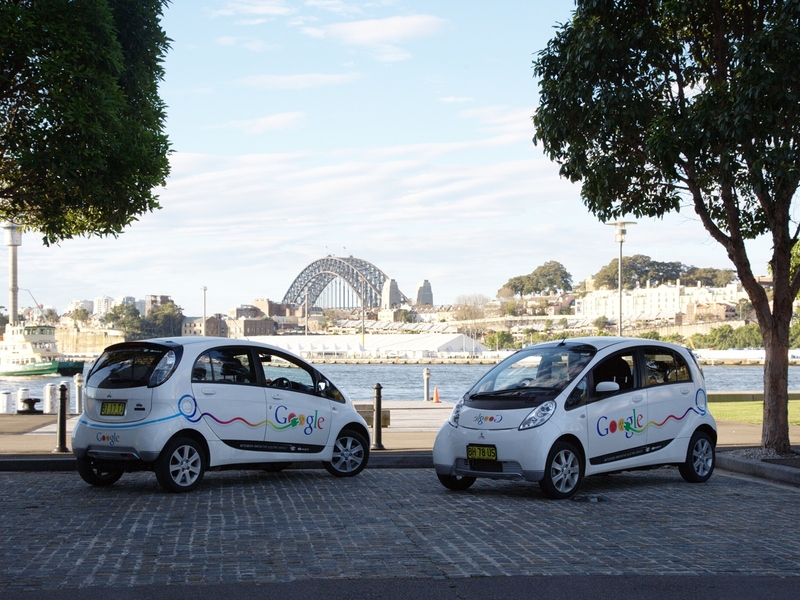 Just over a year ago, Google Sydney welcomed two Mitsubitshi i-MiEVs to our offices. Not only did we think these would be a great way for us to get around, these electric cars are also a good example of innovation and engineering coming together to help the environment. But with only two cars for shared use between over 600 staff, we had big questions about the right way to manage these resources. We didn't want the cars to sit in our parking lot, only available to a handful of people to use on occasion. But at the same time, opening them up 'free for all' might have created problems as well. The answer came from our engineering director Alan Noble who suggested giving 'points' to staff who commuted to work in a sustainable fashion, allowing them to be cashed in for business or personal use of the cars. The idea is by that rewarding environmentally-friendly methods of getting to work, we can amplify the green benefits of having these cars. Google engineers have use of what’s known as “20% time”, where we can devote one-fifth of our working day or week to a Google-related project of our choosing. Since I have a passion for green technology, I started work on building an in-house booking and management system. Google Green Credits - or “GoCred” - is built entirely using Google products and technologies that are available to developers around the world, such as App Engine, mapreduce and the Google Chart API. Today, the two cars are used and 'booked out' for more than 80% of any given week. Over the last year and a half, the cars have travelled a combined total of about 36,000km, and they are completely powered by accredited GreenPower. To relate that to real-world carbon savings, a standard taxi produces about 190g/km of carbon. We estimate that we’ve saved almost six tons of carbon emissions since their cars' introduction. As a sign of their use, our electric cars are frequently dirty, covered in tree seeds, or even scratched and dented. The cars are booked out for business meetings, running errands and have even been used as wedding cars by yours truly! Google engineers pride ourselves on being able to find technological solutions to real world problems. We hope the cars’ popularity and high usage levels, coupled with the carbon saved is a win for everyone. information and communications technology, enhanced with ubiquitous high-speed broadband, hold for Australia’s future prosperity. Internet and communication technology is fast becoming a utility, and just as electricity once transformed the world’s economy during the industrial age ICT will do the same. by 2050, this new “utility” will generate around $1 trillion in revenue for Australia – almost eight times the $131 billion it generates today. The benefits will touch many industries, from public administration to retail, healthcare, education and, surprisingly, mining. Australia will shake off its dependence on the export of natural resources over the next half century. Instead, we will become known as an exporter of services such as tourism, business services, health and education services. For example, the value of tourism alone could match the current mineral exports totalling around $175 billion by 2030. According to the report Australia’s future will be fundamentally transformed by this new utility. It echoes our belief that the web is quickly rewiring Australia’s economy. This may bring some challenges, but it also delivers great opportunities for us all. Yesterday a report about the digital economy released by IBM caught my attention. It cites the great potential that information and communications technology, enhanced with ubiquitous high-speed broadband, hold for Australia’s future prosperity. Google Anita Borg Memorial Scholarship. The scholarship, open to women at university in Australia and New Zealand, aims to encourage us to excel in computing and technology. With applications now open for this year’s recipients, I wanted to share my experience as a past winner and encourage those eligible to apply. During high school, I always felt like the odd one out. All I wanted to do was make websites and program, but none of my friends shared the same interests. Even classmates who were studying I.T. (and who were predominantly male) were interested only in the very basics of software development. At university, I was surrounded by more like-minded people, but being a female still made me the odd one out. One of the biggest benefits of the Anita Borg Scholarship was the chance to meet other passionate women studying and working in the field. All finalists were invited on a retreat to Google Sydney’s engineering centre where we received professional development, career advice and mentoring. We heard from a panel of engineers about career options in industry and academia, tech talks on topics such as web accessibility and Programming Language Design, as well as lots of social activities and sightseeing around Sydney. At the three-day event, I met so many other girls who were also following their dreams. It made me realise there were so many other people who shared the same aspirations, and that’s strengthened my self-esteem and motivation immensely. The scholarship has given me incredible insight into the issues faced by women in computing, and helped me realise my own place as a role model for other girls. For me, I know that when someone asks me why I’m studying computer science, I can now point to some of the role models I’ve met from the scholarship and use them as women to look up to. For further information on this scholarship and how to apply, you can visit www.google.com.au/anitaborg. Be quick because applications close 10 July 2012! Posted by Sasha Bermeister, 2012 Google Anita Borg Scholarship Recipient. Last year, I was lucky enough to be selected as one of the recipients of the Google Anita Borg Memorial Scholarship. The scholarship, open to women at university in Australia and New Zealand, aims to encourage us to excel in computing and technology. With applications now open for this year’s recipients, I wanted to share my experience as a past winner and encourage those eligible to apply. National Cyber Security Awareness Week. Google is a partner in this week and to mark the event, we'd like to share some of our tips for staying more secure on the web. Passwords are the first line of defence against cyber criminals. It’s important to pick strong passwords that are different for each of your important accounts and to change them regularly. For example, try making your password as long as possible, and use a mix of numbers, letters and symbols. Here are some more ideas to help create strong passwords. So you’ve set a strong password - the front door is locked. But imagine how much safer you’d feel if the door was guarded too? If you have a Google Account, you can guard it by switching on 2-step verification. This ensures you’ll have not one, but two security measures to help prevent someone from breaking in. 2-step verification requires you to have access to your phone, as well as your username and password, when you sign in. This means that if someone steals or guesses your password, the potential hijacker still can’t sign into your account because they don’t have your phone. Also, as part Google’s involvement in Cyber Security Awareness Week, we’ve also worked with the Department of Broadband, Communications and the Digital Economy to include Google+ safety tips on their Easy Guide to Socialising Online. For more information generally, visit our Good To Know website - it’s got heaps of tips and tricks for staying safe and secure on the web. You might also like to download the cybersafety help button, which is an Australian Government initiative that provides an online resource hub. Wishing you a safe and secure journey in your online explorations. There are so many things to do and explore online, but just like in the offline world, it’s important to keep yourself safe and secure. Whether you’re a new Internet user or an old hand, it’s good to stay updated on best practices when it comes to browsing the web and sharing your data online. And what better time to take stock than National Cyber Security Awareness Week. At the end of my first year of study (back in the distant past of 2004) I was invited to help tutor at a camp for high school students. The National Computer Science School Summer School is a week-long intensive course that brings talented young people to develop their computer programming and website development skills. Many students who have a passion for computer science are often just part of a small group at their high school. At smaller or regional schools, they may be the only one. This NCSS Summer School aims to help by giving students the opportunity to network at a national level as well as super-charge their skills. For me, camps like NCSS are an unparalleled opportunity for students. They provide a well-tested framework for building interest and finding like-minded people for them to work with. Over the years of being involved in the camp, I’ve seen students grow their high-school curiosity into studies at university, and then into reaching their career or research ambitions. Google has a long history of supporting the NCSS and initiatives like the summer school. In addition to financial support we provide significant in-kind support through Google engineers participating as tutors, site visits and more. In August, the NCSS, in conjunction with the University of Sydney, will hold a programming competition. The NCSS Challenge is open to school students across Australia and New Zealand (in fact, you can take part from anywhere). The five-week Challenge involves being sent instructions to code, but it’s unlike any other programming competition because it’s designed teach students how to program along the way, rather than expecting you to be an expert coder already. Seasoned coders will also be catered for with advanced tasks. Google has been a long time supporter of this initiative and registrations for the NCSS Challenge are now open. You can sign up here. Many engineers at Google have a passion for helping people understand computer science. Initiatives like NCSS are an excellent opportunity for us to share this passion - I only wish I was aware of it when I was in high school! Posted by Nick Cooper, Engineer, Google Australia and volunteer tutor at the National Computer Science School. conference in Sydney’s CBD to talk shop, network and to find out about the latest marketing trends. After our Head of Mobile Ads Jason Pellegrino joined Wednesday’s “So-Lo-Mo” panel via a live Google+ Hangout to discuss all things social, local and mobile, I then had the opportunity to take the stage. With me on the closing panel chaired by Mumbrella editor Tim Burrowes was Aegis Asia Pacific executive chairman Harold Mitchell, Telstra’s corporate marketing director Inese Kingsmill and the new CEO of Photon Group Matt Melhuish. There were many opinions but we did agree that it’s probably the most exciting time ever to be working in the media and advertising industry. Australia punches above its weight in several aspects. For example, Harold Mitchell pointed out while Australia’s 22 million people account for only 1% of the world’s population, we make up 5% of global ad revenue. When it comes to creativity, Australia has one of the highest number of entries for this year's Cannes Lions international advertising festival, with almost 1,300 in total. One of the questions for the panel was: what keeps us awake at night? I’ve gotta say: the speed of our changing world keeps me awake at night. It’s just mind boggling how quickly things are changing. Just take the mobile revolution: within two years we have become one of four leading smartphone nations in the world. Already over half of Australia’s population call a smartphone their own. The way we consume media, communicate with each other and organise our lives is shifting dramatically. I’m sometimes worried marketers down under are not fast enough to adapt to this speed. All of us tend to get fascinated and distracted by bright shiny objects, but we have to remember to look at the data to see where the journey is going, and how quickly. For most marketing executives this means the need to embrace mobile and video more than they have. With our latest integration of video and mobile display inventory into AdWords it’s never been more easy and effective. I still hear from CEOs that they are trying to figure out their “digital marketing.” Today every marketing campaign has to have digital at its core to succeed. The latest campaigns by Commonwealth Bank (“CAN”) and Tourism Australia (“There’s nothing like Australia”) are testament to that. Harold Mitchell called this “owning tomorrow.” So let’s make sure we understand yesterday and analyse today carefully and without dogmas to be prepared for the exciting times tomorrow. The last two days saw the Australian creative, advertising and media industry flock to the Mumbrella360 conference in Sydney’s CBD to talk shop, network and to find out about the latest marketing trends. An important next step in improving all of these areas—comprehensiveness, accuracy, and usability of our maps—is the ability to model the world in 3D. Since 2006, we’ve had textured 3D buildings in Google Earth, and today we are excited to announce that we will begin adding 3D models to entire metropolitan areas to Google Earth on mobile devices. This is possible thanks to a combination of our new imagery rendering techniques and computer vision that let us automatically create 3D cityscapes, complete with buildings, terrain and even landscaping, from45-degree aerial imagery. By the end of the year we aim to have 3D coverage for metropolitan areas with a combined population of 300 million people.